Volketswil, Switzerland: –Innovative printing solutions for lean packaging processes from Swiss-based Hapa AG aroused intense visitor interest at the recent interpack 2014 expo in Düsseldorf. Hapa is a world-leading provider of a number of innovative printing systems for the pharmaceutical, cosmetics, food, and medtech industries. Its patented technologies, including Universal Label Printer, Hybrid, BlisterJet, LabelJet, EasyFlex and redcube, appeared not only on their own stand at the show, but also as integral parts of several other exhibitor displays. All systems demonstrated Hapa’s mastery of leading-edge print capabilities and flexibility in printing directly onto a very wide range of substrates and products. Additionally, Hapa highlighted designer inks from its newest division, Hapa Ink. With their in-house CMYK colours and high-density white, Hapa Ink verified its products’ excellent print qualities and almost unlimited range of applications. Interpack demonstrations of Hapa‘s bestseller, the Hapa 230-Hybrid, confirmed the system’s unparalleled flexibility thanks to its ability to apply UV Flexo and UV DOD technologies separately or in combination. The Hybrid also premiered Hapa’s new multi-touch panel, incorporating modern HTML-5 and user-friendly web-based technologies. The compact, multi-functional UV DOD print module, Hapa redcube, showed its impressive ability to print directly onto BFS vials and pre-glued, flat cartons. The redcube also demonstrated excellent print quality when integrated within a Qualivision mark and verify, Track and Trace solution. The system that drew the biggest crowds, however, was the IPS line, integrated range of technologies from Hapa and sister companies Laetus, FlexLink and ADMV. On this line, designed specifically for interpack, a redcube printed iPad photos of visitors directly onto tins of mints. The Universal Label Printer, a fully-digital UV DOD Piezo inkjet system, demonstrated application flexibility on aluminium foil, medical paper, Tyvek, and other foils including transparent materials and PSA labels. Hapa’s Late Stage Customization solution, BlisterJet performed a one-color UV DOD print on aluminium blister packs, while the UV Flexo printer EasyFlex printed on aluminium foil. 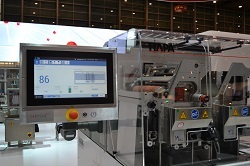 The LabelJet, integrated with a labeller, delivered pin-sharp CMYK print on labels in a serialisation application. Elsewhere at interpack 2014, a Hapa top-mounted EasyFlex UV Flexo web printer formed part of the FAMAR display, printing one colour on aluminium foil, while the Bausch & Ströbel stand showed an integrated LabelJet DOD printer performing serialization printing in a CMYK application. 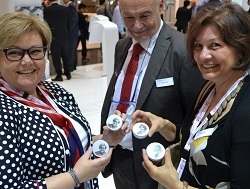 “Mint Print” – the direct-print onto tins of mints by the UV DOD inkjet print module redcube was popular with the Interpack crowds. 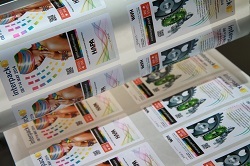 Hapa’s printing systems are developed and produced at its headquarters near Zurich, Switzerland. Hapa also has presence in the USA, UK, Germany, India, Mexico, Brazil and Japan, employing some 150 people in total. There are more than 2,000 Hapa machines in service in more than 50 countries worldwide. Thanks to its more than 50 years as a partner to the pharmaceutical industry with its strict regulatory environment, Hapa possesses invaluable know-how that translates into highly relevant and effective solutions. The company is a proud member of Coesia Group. Headquartered in Bologna, Italy, Coesia comprises 14 globally operating companies, active industrial leaders in automated machinery, industrial process solutions and precision engineering. The Interpack Trade Fair, held every three years in Düsseldorf, Germany, is one of the world’s leading events for the packaging industry and related process technologies. This year’s event, held May 8-14, attracted an estimated 175,000 visitors and featured some 2,700 exhibitors, of whom almost half showed solutions aimed at the life sciences industries. Organisers Messe Düsseldorf say interpack 2014 set new records for attendance, exhibitor numbers and overseas representation, with 66 per cent of visitors attending from outside Germany and some 130 countries represented at the event. The extensive supporting programme was also seen as highly successful, especially the associated World Save Food Congress organised in co-operation with the UN Food and Agriculture Organisation to highlight issues global food loss and food waste. This attracted more than 450 delegates and a range of prominent guests and participants including FAO and UNEP representatives, the Senegalese Minister and musician Youssou N’Dour and the former German Federal Minister Renate Künast. Click on Hapa lean process print systems draw crowds at interpack 2014 for other information.